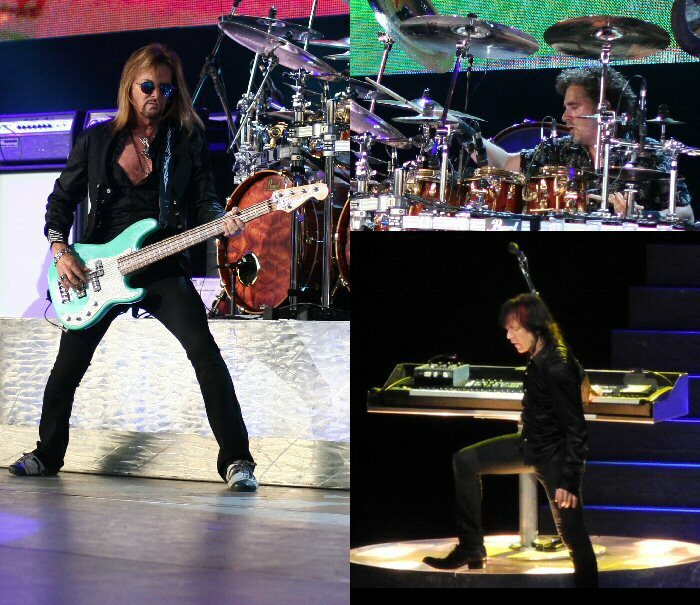 The "Progressive U.S. Tour" - featuring two monsters of classic rock, STYX and YES - rolled into the PNC Bank Arts Center in Holmdel, New Jersey on Tuesday, July 5, 2011 for the second night of their much anticipated summer tour extravaganza. 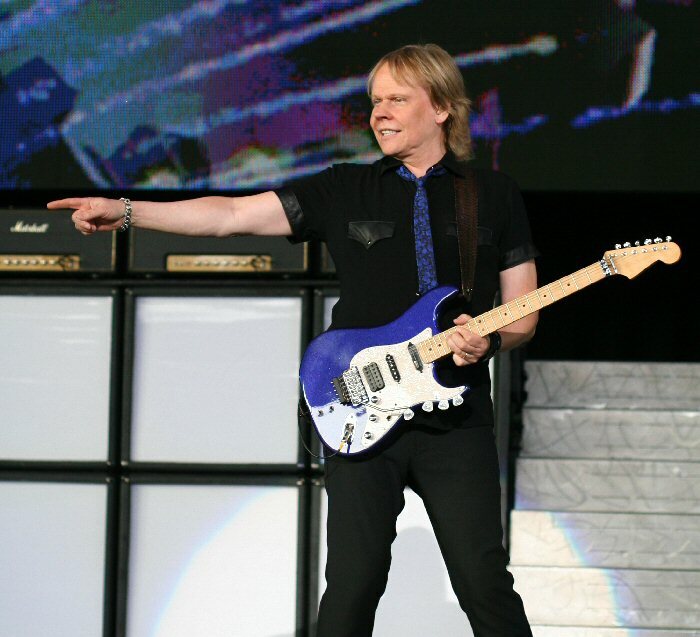 Tommy Shaw and Styx continue to "suit up" and bring it each and every show. The trend of co-headlining has become popular in recent years. 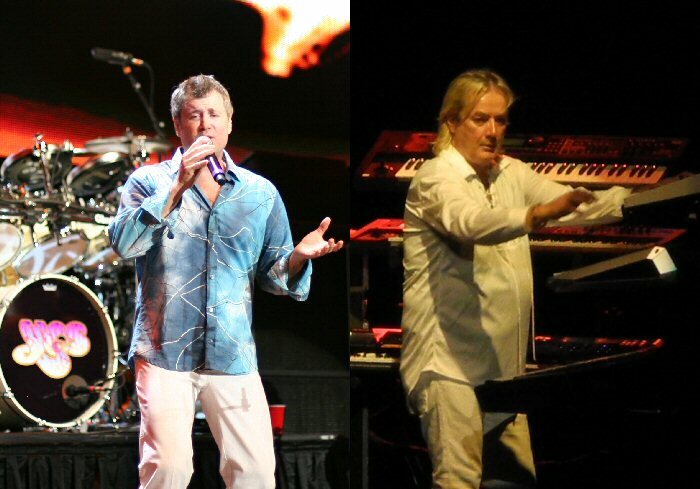 In the case of the "Progressive U.S. Tour" the pairing brings together two outfits that have followed a similar course in their career paths. Both bands emerged from the world of progressive rock and are now currently touring without a much loved member. They each reached their commercial peak in the 1980's on the strength of their radio and MTV airplay. By teaming up the groups benefit from the opportunity to play to new people and fans win with more bang for their concert buck. Styx are best known for a string of hits including "Babe", "Come Sail Away", "Lady", "Renegade" "The Best of Times" and "Too Much Time On My Hands". During the height of their popularity they had four consecutive multi-platinum albums. Yes are well respected for their complex musical compositions such as "Close To The Edge", "The Gates of Delirium" and "Roundabout". Yes has also sold millions of records with the new Fly From Here out in July 2011. 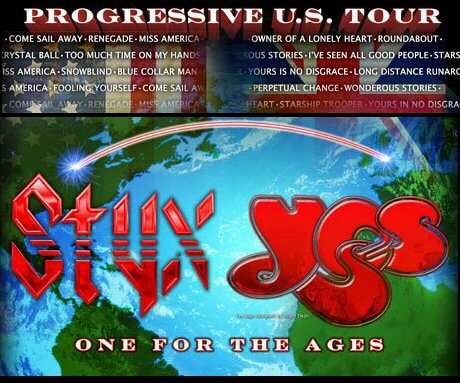 We were excited to see Yes and Styx join together teaming up for a 22-city tour running from July to early August. Both bands have signature sounds, strong fan bases and each have had their fair share of trials and triumphs during their long and successful careers. Styx and Yes have each weathered the departure of a beloved lead singer and songwriter. In the case of Styx - it was Dennis DeYoung who penned some of their most popular songs. Since 1999, Styx has reformed with Lawrence Gowan on keyboards creating a stable and dependable lineup. The only disturbance was a change in bass players when Ricky Phillips stepped in for Glen Burtnik in 2003. This unit has toured extensively and have developed a machine-like precision in their stagecraft and concert production. Singer Jon Anderson - known as the voice of Yes - was replaced by them in 2008 following a medical crisis. Longtime classic keyboardist Rick Wakeman also bowed out of the band at this time. Yes responded by hiring tribute singer Benoit David and Wakeman's son Oliver to fill in for the caped-one. For this tour Yes have opted to hit the road with former member Geoff Downes back in the fold. Thus, Yes has had to deal with more flux in their team. James "J.Y." Young is the captain of the good ship Styx. The sharply dressed Styx took the stage loud and strong. 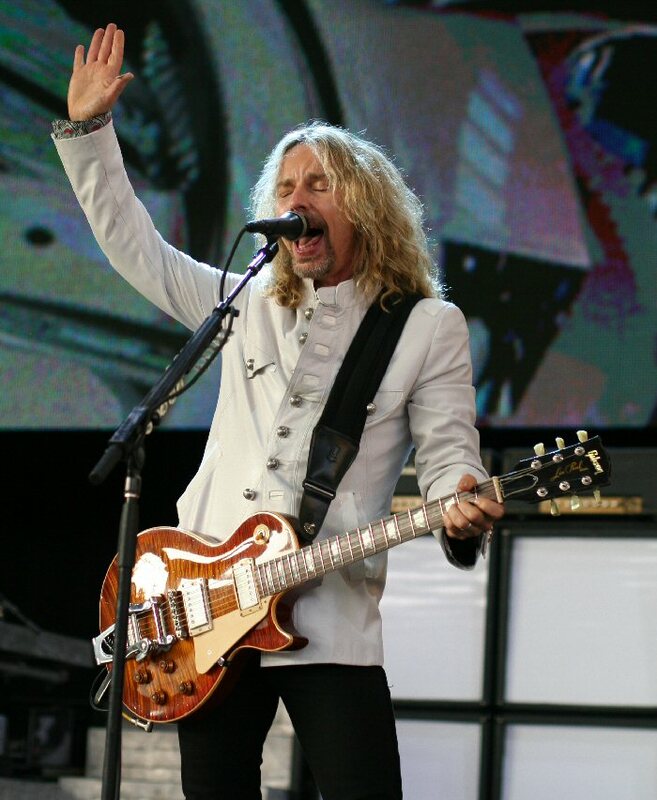 Tommy Shaw (singer/guitarist) wasted no time connecting to the crowd, raising his hands above his head to encourage the fans to clap along to an energized "Blue Collar Man". Shaw worked the whole stage smiling, pacing and playing to the audience. "The Grand Illusion" was handled capably by Lawrence Gowan. All through the night he was engaging and energetic. We've heard on more than one occasion from fans that Larry has now completely won them over. Styx also used the screen behind the stage for additional lighting and visual effects. Their presentation was polished with plenty of crowd pleasing hits. "One With Everything" featured harmonizing vocals and interesting progressions. "Too Much Time On My Hands" integrated crowd participation with the fans singing the familiar refrain. Gowan began "Lady" at his spinning keyboard but as the song built momentum he moved to the front of the stage to sing to the audience. "Man In The Wilderness" ran the gamut from reflective to rocking with Shaw switching from an acoustic to an electric during the song. Backing vocals added to the piece. It was followed by a bold "Suite Madam Blue". Founding member Chuck Panozzo came out to play bass on "Fooling Yourself (The Angry Young Man)". The band expanded on the piece for a few moments with the guys posing and moving their instruments in unison as Gowan played the keys with his back to the ivories. They moved into a colorful version of "Miss America " using lots of red, white and blue imagery behind the set. The "new" guys in Styx are Todd Sucherman/drums; Lawrence Gowan/keyboards; and Ricky Phillips, bass. Before closing with "Come Sail Away" Lawrence led the audience through a few lyrics of rock songs before declaring "now you're ready". The classic sailed along with its heavy hooks and expanded instrumentation. The encore was a rousing version of "Renegade" integrating a few more rock stances and crowd clapping - thus maintaining the connection that had been a constant through the fine Styx set. We have seen Styx a number of times over the past few years and have found them always to be professional and personable delivering solid rock shows peppered with fan favorites. We have also checked out the current version of Yes during a similar time frame and have enjoyed their concerts. However, on this Tuesday night the band with more stability was the stronger of the two on this double bill. Yes took the stage as instrumentation from their new album filled the arena. They started with "Tempus Fugit" which flowed along through funky progressions with Steve lavish on his guitar leads "Yours Is No Disgrace" worked well. Benoit started off beautifully in the soaring "Heart Of The Sunrise" but lost some notes and from that point forward struggled vocally throughout the set. Having seen David before we know he is capable of the catalogue but was having some difficulties on this summer eve. There were other issues that the closing act Yes faced including spotty transitions and tempos. The music of Yes is complex and chemistry is key in making all the connections. The fact that keyboardist Geoff Downes is relatively new to the live lineup could have accounted for some of the problems. Yes are seasoned professionals and they have been known to get off to rocky starts on recent past outings only to tighten up as their tours progress. However, fans are tuned in and following along like never before on various Internet websites and message boards. Original reports panned the opening night debut in Camden and the PNC show received similar criticism. The shaky start wasn't lost on the band as Squire announced from the Holmdel stage that this was only their second night out and "hopefully we'll be good on night three." The Progressive U.S. Tour - One For The Ages. Adding fuel to the fire and ongoing drama Downes took to his blog to admonish Internet critics on sites like YesFans.com and ProgressiveEars.com. Knowing that the band itself was aware of their less than stellar effort and their fan's response to it - it will be interesting to see if they can clean up their act as the "Progressive U.S. Tour" progresses. Yes moved into "I've Seen All Good People" with the fans helping as they clapped and sang along. "We Can Fly" from the new album featured free flowing instrumentation mixed in with the story. "And You And I" showcased Steve aptly playing a number of axes through the song as classic Yes artwork was displayed on the screen behind them. Unfortunately, Yes never even got close to having the edge that made them one of the most accomplished and respected musical acts in rock history. Fans wondered whether Benoit was sick since he missed many of the high notes required - or just plain aborted crucial lines on some attempts to get to his upper register. It wasn't all bad, though. Steve Howe was as dependable as ever and many fans noticed Alan White's increased vigor behind the drum kit. Others gave props to David for his effort and enthusiasm despite his difficulties during the performance. They carried on with their classics "Owner Of A Lonely Heart" and "Roundabout". The encore "Starship Trooper" was spacious with its vast instrumentation and message of interstellar travel. Some fans hoped for more songs from the new CD. In the summer of 2011 the Yes tour for Fly From Here launched with less than flying colors. Ultimately, the lesson from the tale of these two classic rocks bands is that practice makes perfect. The surprising plot twist was that on this night Styx was the stronger act - a fact that might of been unheard of back in the day. 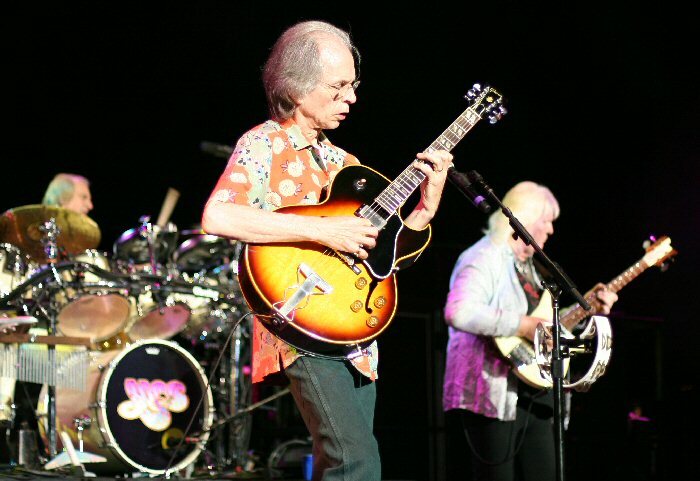 The core of classic Yes - Alan White, Steve Howe and Chris Squire. The "new" guys in Yes - Benoit David and Geoff Downes.